Today’s autonomous vehicles require detailed 3-D maps, but a novel system enables navigation with just GPS and sensors. Companies such as Google only test their autonomous vehicles in major cities - where they have spent countless hours meticulously recording the exact 3-D positions of the likes of lanes, curbs, ramps and stop-signs. So, if one lives along the millions of miles of roads that are unpaved, unlit or unreliably marked, one cannot use autonomous driving. Such roads are often much more complicated to map, and get a lot less traffic - so companies have little incentive to develop 3-D maps for them. In a first step to overcome the problem, CSAIL have developed 'MapLite' - a framework that allows self-driving cars to drive on roads that they have never been on before; and without 3-D maps. MapLite combines basic GPS data that can be found on Google Maps with a series of sensors that observe the road conditions. Combined, these two elements permitted the team to autonomously drive on multiple unpaved country roads, reliably detecting the road more than 100 ft ahead. 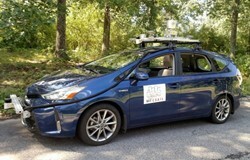 In collaboration with the Toyota Research Institute, the researchers used a Toyota Prius car that they fitted with a range of light detection and ranging (LIDAR) and inertial measurement unit (IMU) sensors.